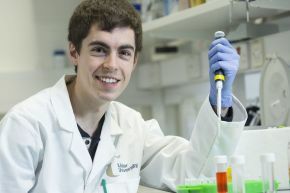 David Courtney will today graduate with a PhD in molecular biology after spending the last three years as part of a team of Ulster University scientists pioneering research into the world's first cure for hereditary blindness. David's research focused on developing personalised medicine that targets and repairs genetic damage in part of the eye. "In the field of molecular biology using genes to treat or prevent disease is a area of huge potential and I wanted to jump right into this exciting and novel research. Ulster University provided me with this opportunity and having competed a BSc in 2012 at the University, I knew I would get a first-class learning experience working side-by-side with world-leading biomedical researchers. "The research helped to discover a treatment that can repair damage caused by cloudy deposits in the outer part of the eye, which can worsen with age and eventually lead to blindness. It was truly an honour to be part of a team that was so committed to shaping the future of vision science and treatment." During the second year of David's PhD, he was one of a few Northern Irish researchers accepted for the prestigious Winston Churchill Memorial Trust travel fellowship. This gave him the opportunity to travel to Aarhus University, Denmark, and the Modena Centre for Regenerative Medicine, Italy, to explore more about vision science in Europe and bring this knowledge back to his research at Ulster University. This research was recently highlighted in an issue of Nature, one of the most well recognised and respected scientific journals in the world. Nominated by his PhD supervisors Professor Tara Moore and Dr Andrew Nesbitt, David was also awarded the John RE Scott Postgraduate of the Year prize. "I am extremely grateful to my PhD supervisors for the help and guidance they gave me during the entirety of my studies. I have grown immensely during my time at Ulster University. In January, I begin an exciting postdoctoral position at Duke University in North Carolina, USA, where I will continue with my research. I am really looking forward to starting this new chapter of my life with my girlfriend Caroline."